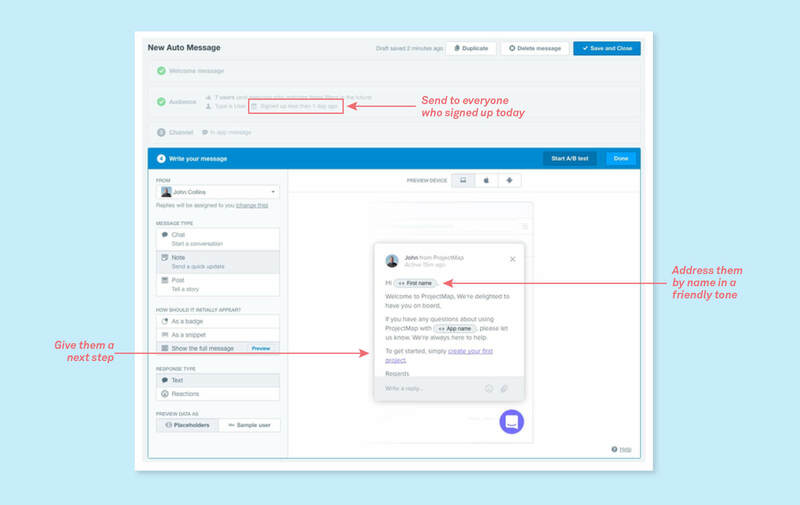 At Intercom, we’ve worked with hundreds of our customers, helping them target messages to their customers and improve their messaging schedules. Onboarding messages have 3 goals. Firstly, you want to welcome the customer and set a friendly tone for your product. Secondly, you want to give them a touch point if they have any questions. Finally you want to give them a next step – somewhere to go from here. Everything you wanted to know about marketing but were afraid to ask. Unfortunately, many apps still just send a welcome email and assume the job has been done. This is the wrong way to speak to someone who has essentially just walked into your store. The right time to welcome someone to your product is when they’re in your product, not when they’re on the toilet checking their mail one hour later. All of the data we have says that in-app welcome messages are more likely to be read, clicked on, and responded to, which is why we encourage our customers to use them. 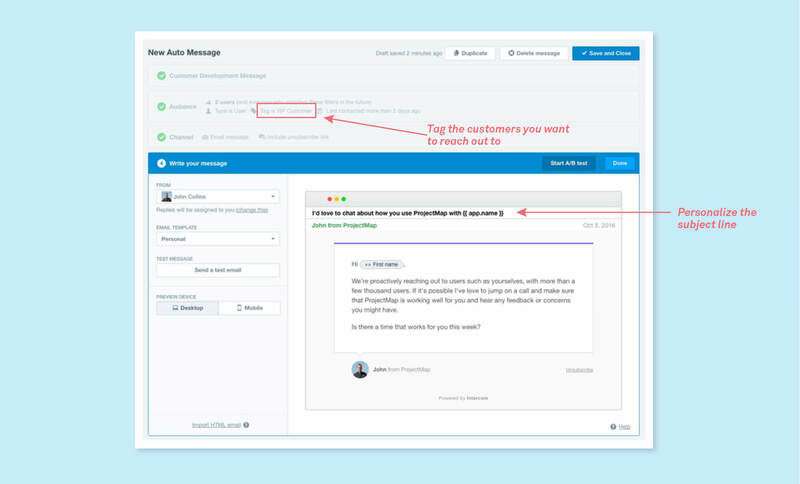 Here’s how you’d set up a welcome message in Intercom in 30 seconds. 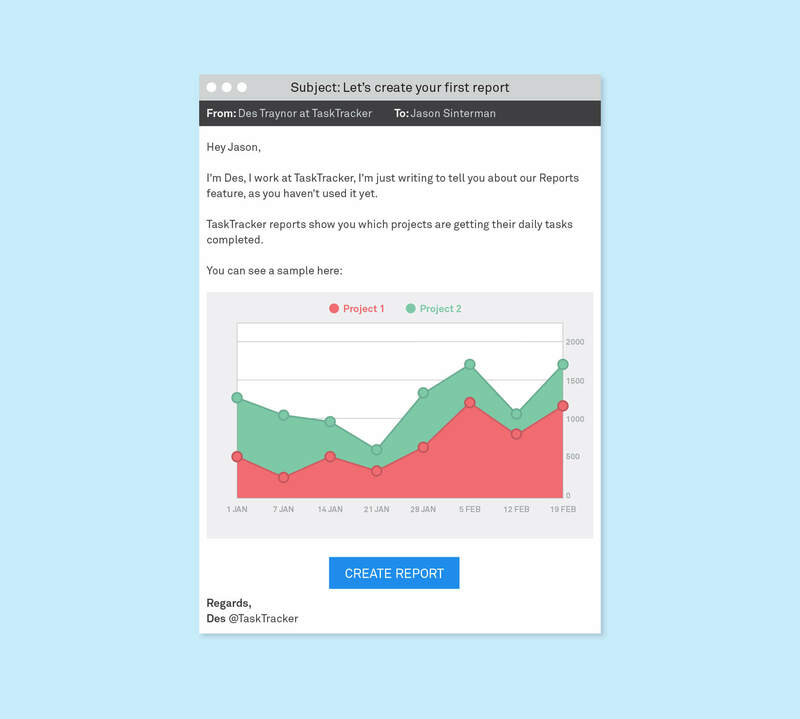 We’ve written before about the subsequent messages you’ll want to send to ensure new users starting getting value from your product. If you really want to dive deep into onboarding, you should download our free book on the topic. As a customer digs deeper and deeper into your product, you want to expose more value and highlight more features to them. But you want to try and ensure those messages arrive at the relevant time for the user. 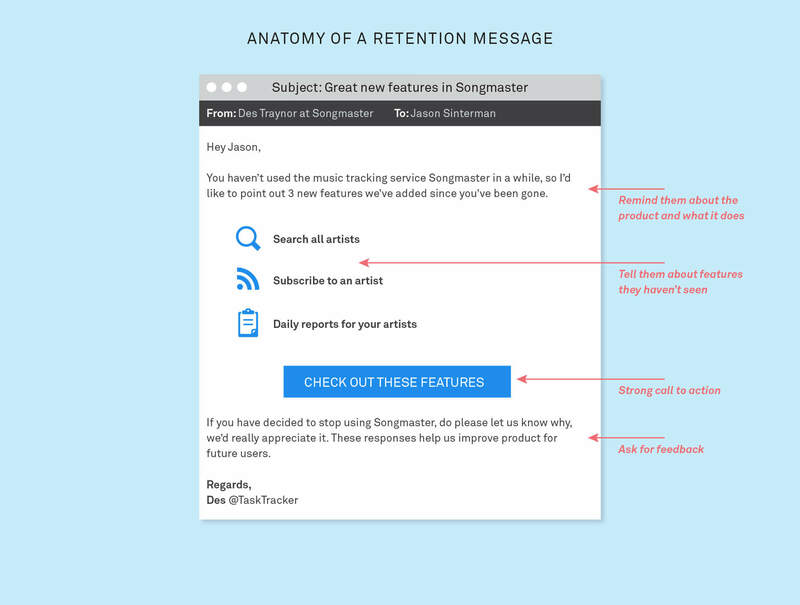 In Intercom, features like tagging or keyboard shortcuts, don’t offer new users any value. So instead we promote them when the conditions are just right for specific users to hear about them. For example, this might be after their 20th, 40th or 60th session in the inbox and only if they’ve had more than 20 conversations with their customers. These are the attributes and behaviors of an Intercom user who cares about things like keyboard shortcuts. When you’re starting out you’re going to have some high-value users that you want to give a little white glove treatment to. Maybe they’re your highest-paying customers, maybe they’re your “earlyvangelists”, or maybe you think their logo would look great on your marketing site. For whatever reason, these are the customers you’d like to pay particular attention to, so naturally this means contacting them personally. In the early days of Intercom a message like that filled up my calendar every week with calls and started lasting relationships with many of our most valuable customers. As we’ve said before, the when and where of customer feedback can’t be ignored. Active customers have different ideas and issues on day two compared to day twenty. As customers mature within your product, the feedback shifts from gut reaction requests to ones that offer insight into exactly what jobs they hire your product to do. Setting up some well-timed survey questions is an easy way to gather these feedback by a common perspective, and helps you separate the gut reaction feedback (“Surely the iPhone has to support Flash!? !”) from the considered thoughtful feedback (“I’d love a faster way to switch apps”). Another valuable thing about them is that they help you proactively identify any issues your regular loyal customers are having, meaning that you can solve problems before they become deal-breakers. The dumbest retention message I see is “We miss you 🙁 Please log back in”, and here’s the funny part: even that one performs well. The best performing retention message I’ve seen was shown to me by one of our customers. It’s an email listing out all the features added in the past 30 days to users who are inactive for the past 30 days, ensuring that it’s always telling people about features they haven’t heard of, but more importantly it follows the key rule of customer communication: don’t tell people to do something, motivate them to do it.